This week I am excited to be exchanging guest posts with fellow travel blogger Dave Cole of Cook Sip Go. 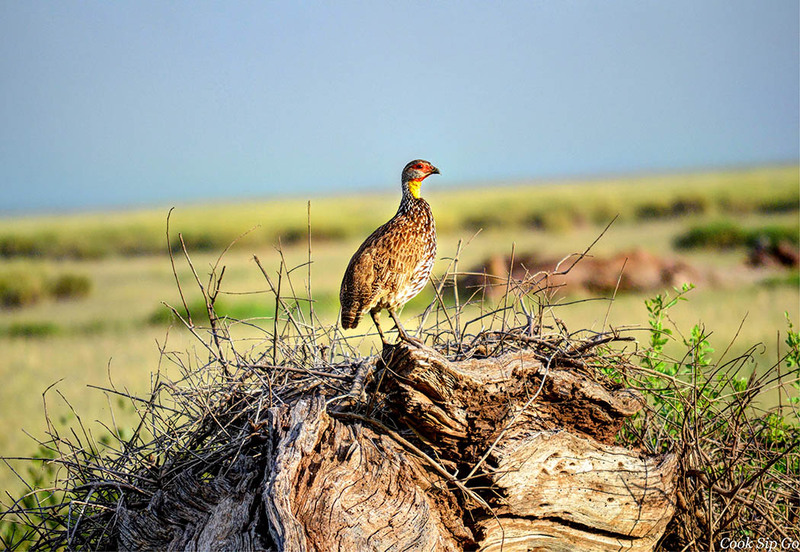 Based in Addis Ababa Ethiopia, Dave has traveled extensively in Eastern Africa and in this post he writes of the colorful array of birds seen while on a visit to the Amboseli National Park in Kenya. Kenya’s Amboseli National Park is located near the border with Tanzania and is an easy 3-4 hour drive south from Nairobi. 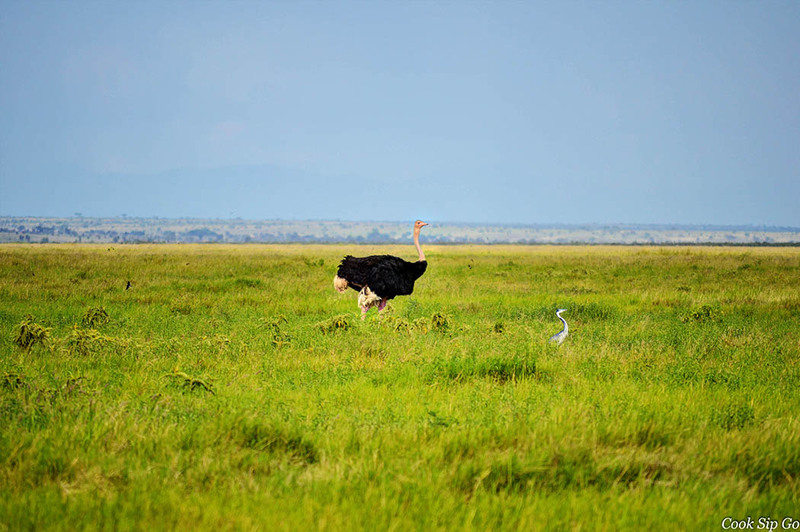 Amboseli is of one of the top places in Africa to view large herds of elephants and its views of Mt. Kilimanjaro are equally renowned. Just as impressive, though, is the colorful array of birds at the park, which draws birders from all parts of the world. 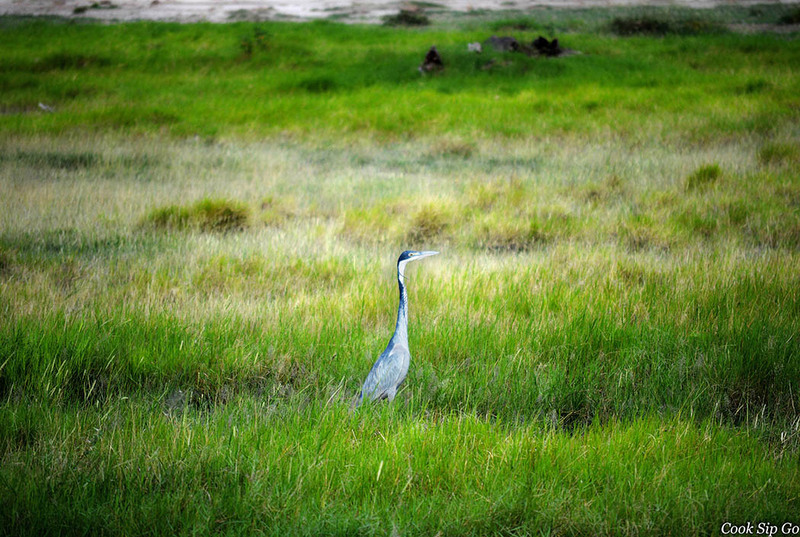 The low-level swamps and seasonal waters of Amboseli are a big attraction for the birds. As many of these areas are close to the roads, a game drive will allow some excellent spotting from several meters away. 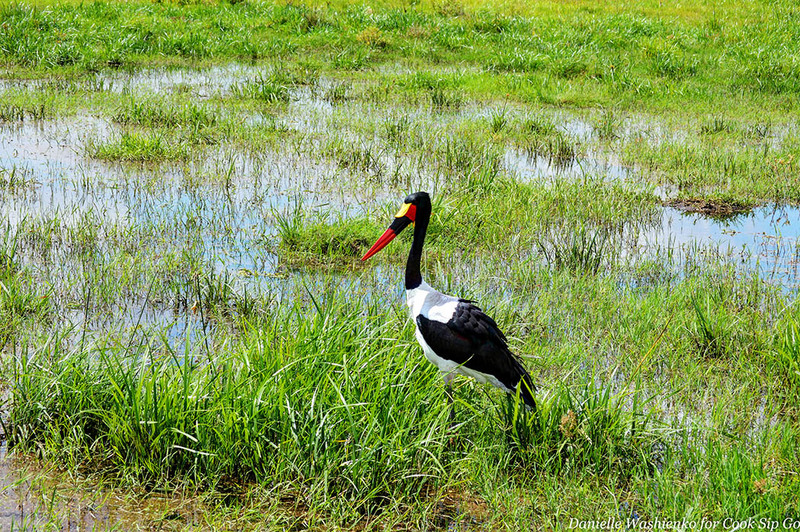 The long-legged flyers love the shallow pools and the park is filled with egrets, Yellow-billed Storks and the visually stunning Black-headed Heron. They are joined by the unmistakable markings of the Saddlebill. 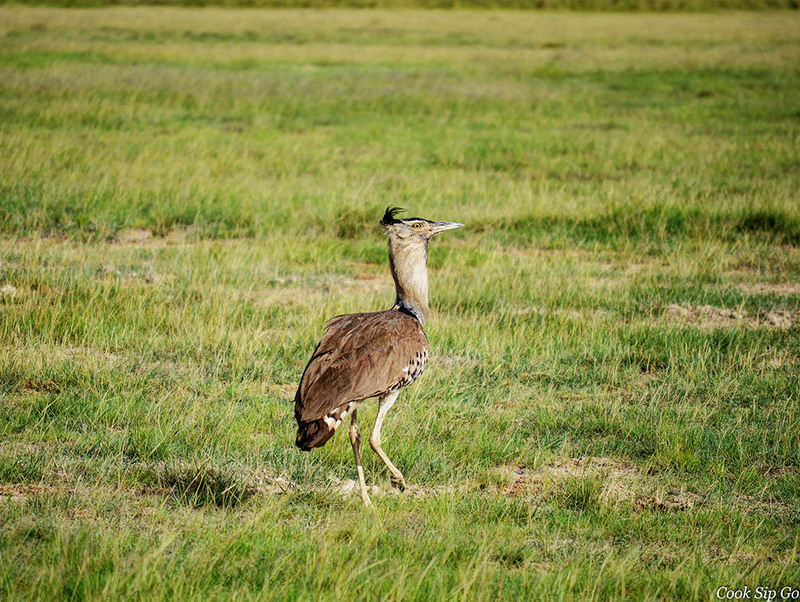 The Kori Bustard is the largest bird that can achieve flight. When one takes off in the distance, the bird’s wingspan might cause you to confuse it for a small plane. 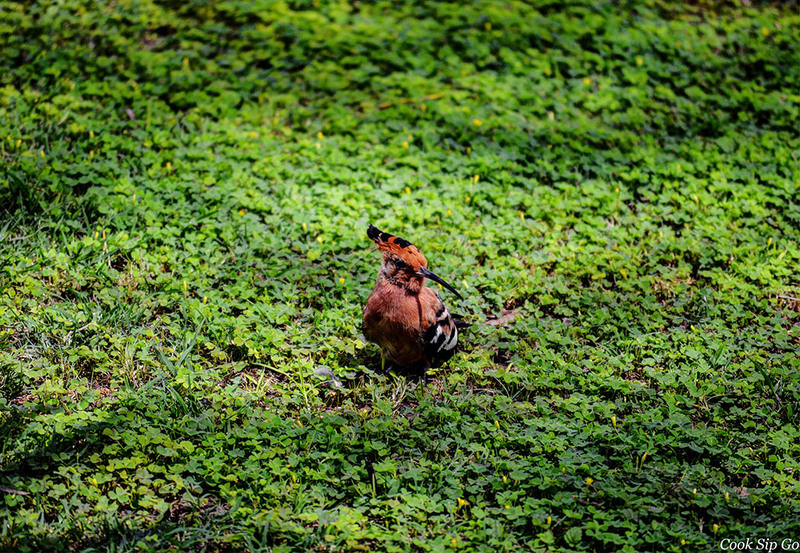 Even walking around the grounds of a lodge in Amboseli can yield some beautiful birds. 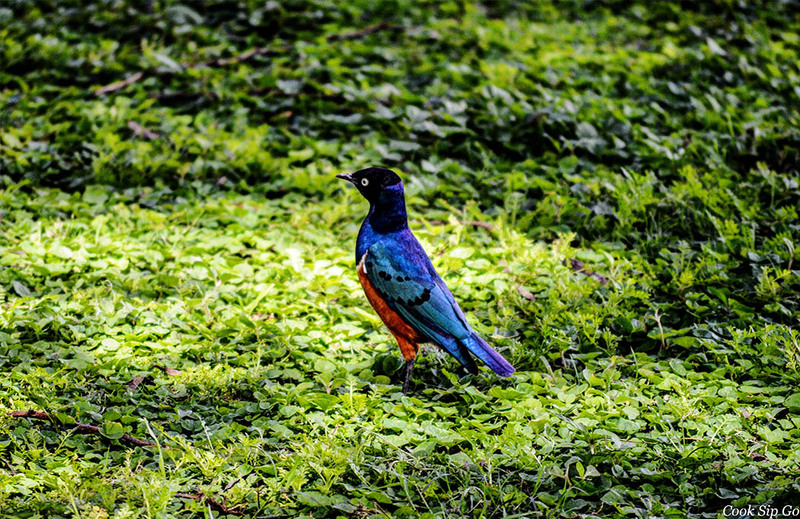 The Superb Starling is an attractive mix of bright feathers, while the Hoopoe has a very distinct head and beak. As someone used to the pigeons and sparrows of New York, I was especially struck by the interesting appearance of certain birds. I loved the secretary bird’s fancy plumage and the unique shape of the Hamerkop’s head. 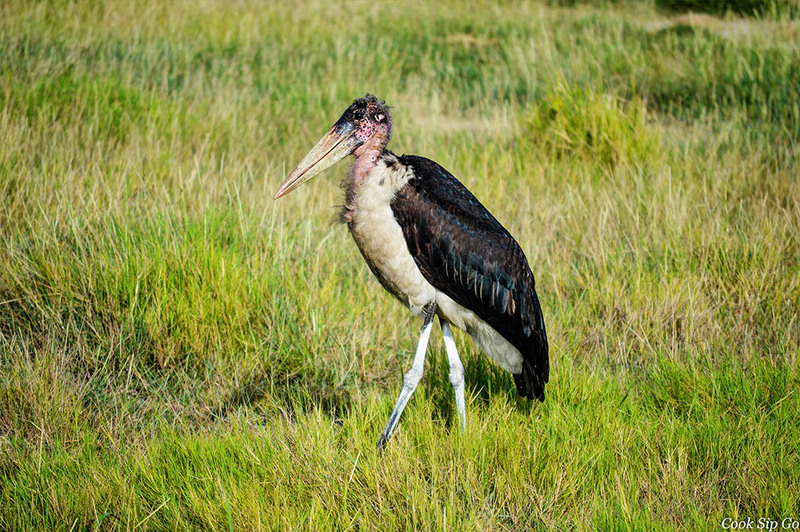 One of the most easily spotted birds in the park is the Marabou Stork. 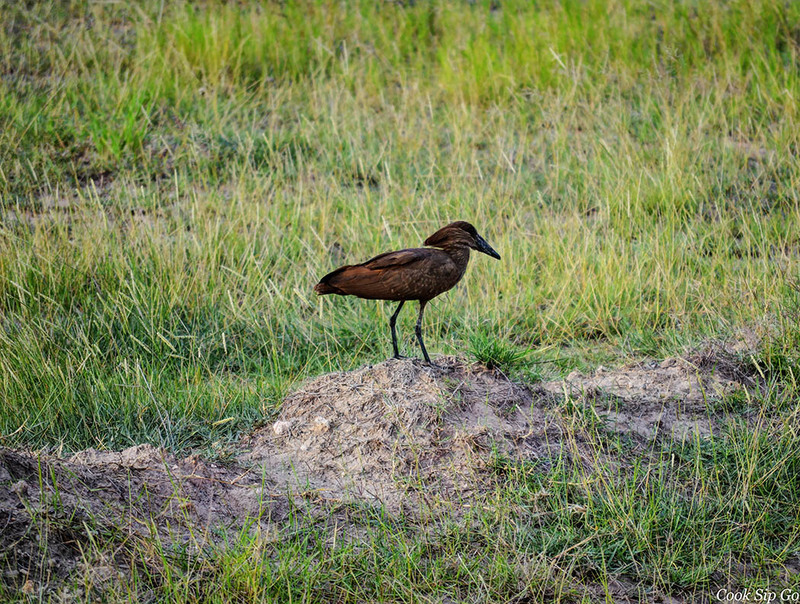 Often referred to as the “undertaker bird” for its appearance from behind, the marabou and its rather strikingly unattractive face are omnipresent. 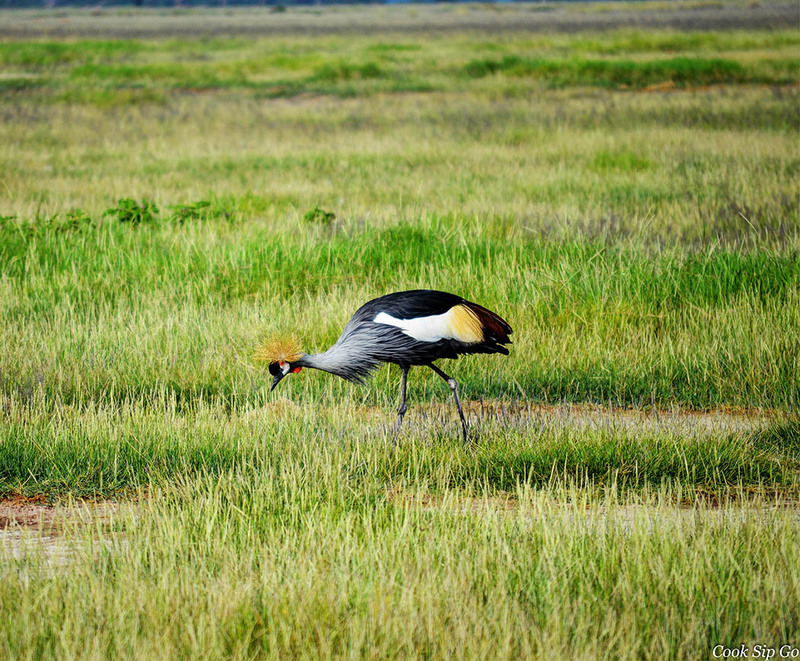 Of all of the birds I saw, I enjoyed the Grey Crowned Crane the most. Its graceful movement and palate of colors merited stopping the safari car and observing for a few minutes whenever we encountered a flock. 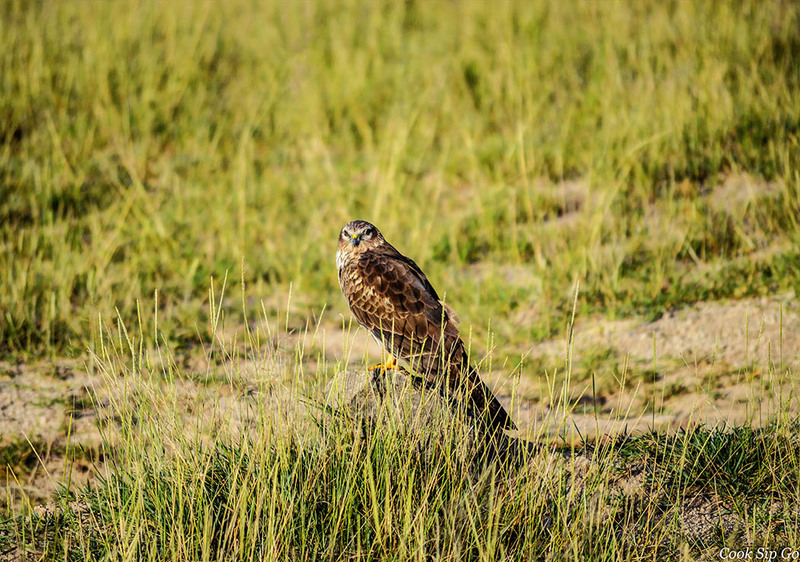 While I did not see many birds of prey in Amboseli, Lanner Falcons were visible overhead several times, scanning the grasses for their next meal. One stopped for a rest long enough for me to snap a photo and the concentration and determination are evident in its eyes. A few days in the park will yield countless lapwings. 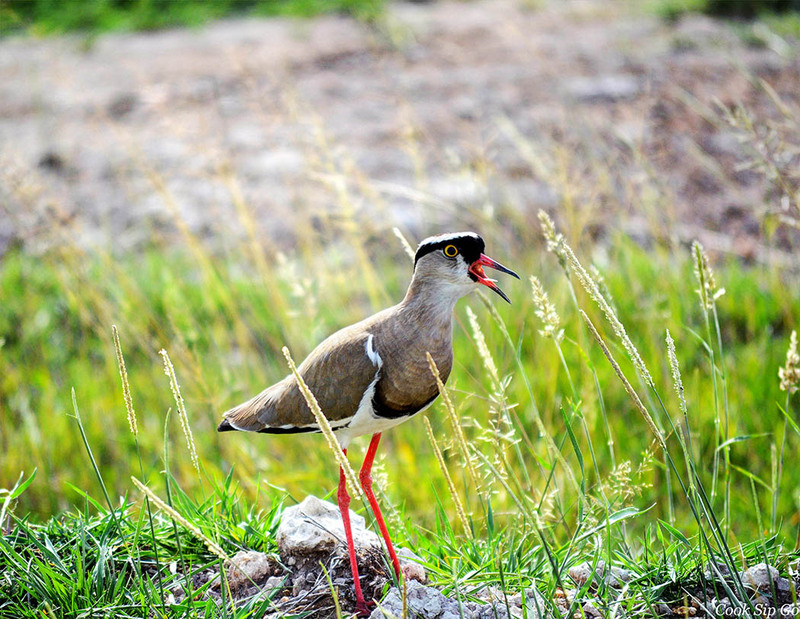 The Black and White Lapwings dot the grasses and the Crowned Lapwing is a vocal addition to a quiet savannah. 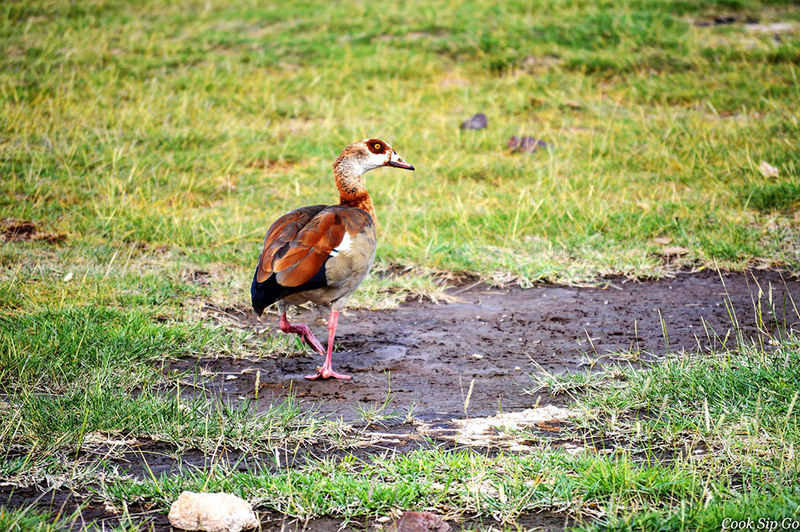 No East African bird photo essay would be complete without a shot of the Egyptian goose. 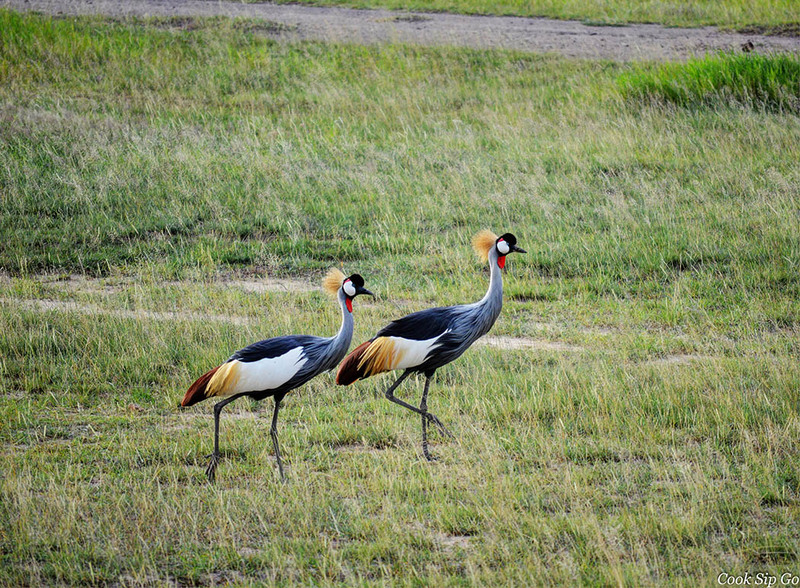 I have seen flocks of them throughout the rift valley and they will always be a warm reminder of my travels in Africa. Thanks to Dave Cole for taking part in this collaboration. Check him out on Facebook and follow him on Twitter. Dave Cole, is a travel, food writer and photographer behind Cook Sip Go. His posts chronicle his interactions with the local life and food of destinations worldwide. Cool photos!! Some of these birds look familiar, some of them I’ve never seen anything like before I my life. I’m seeing a lot about Kenya these days, and Africa in general. It sounds like a paradise for all things natural and wild. Check this series out. I took them when i was down in the rift a while ago. Amazing shots, you must be a very good photographer to take such shots (shooting birds is not easy – requires a lot of time,patience and concentration). 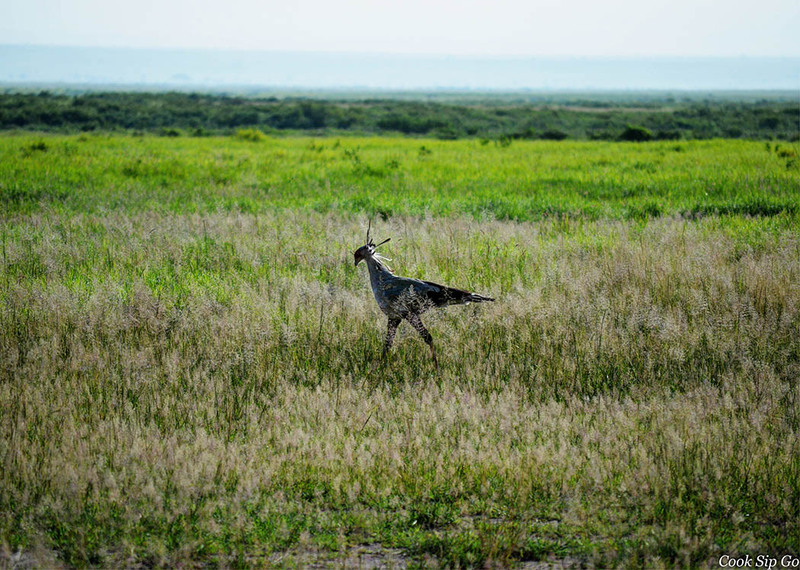 You should also note the secretary bird is also a bird of prey. 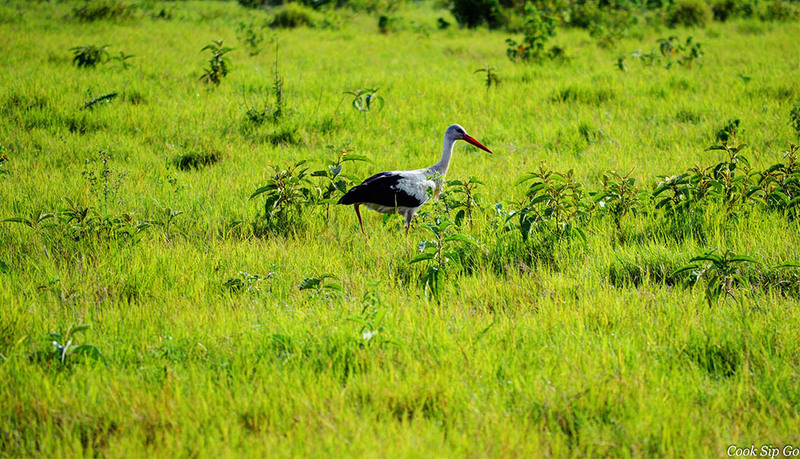 Marabou storks must be the ugliest birds in the universe! These are AMAZING photos! Dave is awesome! Some of these birds don’t even look real, like nothing I’ve ever seen. Dave, Your photos are stunning as always. What lens are you using to get up so close to these beauties? Rachel fantastic post and thanks for linking it up with Weekend Travel Inspiration! Really spectacular, you really captured these magnificent birds in their natural environments, beautiful! Dave is talented. What amazing photos! I’ve never been into birding, but this post has convinced me that it would definitely be worthwhile during a trip to Kenya. Such a great variety of birds with such beautiful plumage! Wow!! Dave , you actually make bird watching look worthwhile. I have always thought of it as boring, but if the end result are these shots, I am all for it!! Great collaboration between the two of you! Enjoyed reading Dave’s post. Wildlife in Kenya doesn’t stop to impress me. Not surprised that Dave enjoyed the most Grey Crowned Crane. It’s gorgeous! Very nice photos, such vibrant colours. This is probably somewhere I will never visit so it’s nice to read about others’ adventures. Thanks for sharing. Wow, I’ve never seen so much beautiful birds in one post and the shots are really stunning. 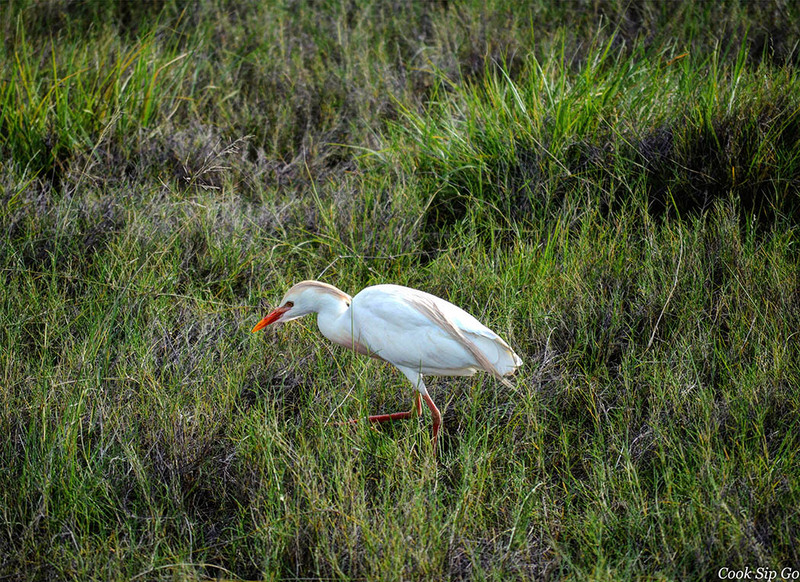 II have not heard about many of these birds and it great to learn about them. I’d definitely would love to visit Amboseli someday to see these spectacular creatures. Diana - Life in German. I love the post, the pictures are amazing, and so are yours, I read your post on Dave’s blog. What a magnificent collection of birds! I love all the colorful ones and can’t get over how diverse they all are. Sights like these make me want to visit these parks so badly. Great job, Dave! I love that first shot! Beautiful pictures and great variety of birds showcased.